Light Blue Italian Zest Perfume by Dolce & Gabbana, Light Blue Italian Zest for Women, released in 2018 by Dolce & Gabbana, is the most recent addition to their popular Light Blue line . Created to call to mind hot, bright days and warm, sensual nights on the Mediterranean coast, this perfume is perfect for the woman who wants to keep the scent of summer with her always. Top notes of bergamot, lemon verbena, bellflower, green apple and lemon offer a sunny, crisp opening. Heart notes of jasmine, rose and bamboo create depth, warmth and complexity. Cedar, amber, vanilla, musk and sandalwood create a base that mingles soft warmth with mystery and sensuality. 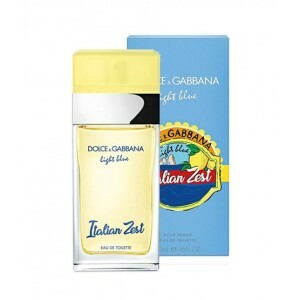 Beli parfum original D&G Light Blue Italian Zest for Women sekarang, harga termurah di Indonesia! !